The physiology section of Chap. 32 applies to this chapter as well. Respiratory alkalosis, also called primary hypocapnia, is characterized by low pCO2 and high pH (> 7.40). Primary hypocapnia reflects pulmonary hyperventilation. 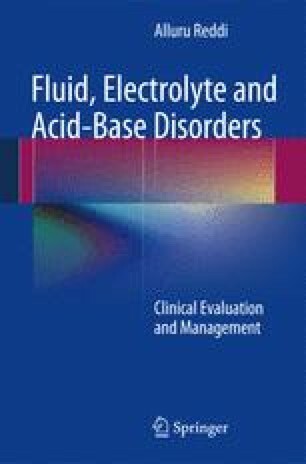 The resultant alkalinization of body fluids is ameliorated by a decrease in serum [HCO3 −]. Secondary hypocapnia should be distinguished from primary hypocapnia, as the former occurs in response to metabolic acidosis. As soon as respiratory alkalosis develops, a decrease in serum [HCO3 −] occurs within minutes. This is due to nonbicarbonate buffering as well as H+ release from tissues. Lactate is also produced by alkalemia. This buffering from various sources persists for several hours, and the resultant acid–base disturbance is called acute respiratory alkalosis. During acute hypocapnia, the H+ secretion in both proximal tubule and cortical collecting duct is suppressed. When alkalemia persists, renal compensation starts with a decrease in both H+ secretion and basolateral exit of HCO3 − in the proximal tubule. This lowers serum [HCO3 −] even further, due to which, the pH is maintained close to normal. The full renal compensation takes 2–3 days for completion, and a new steady state is established which is called chronic respiratory alkalosis.